MackieMade Paper Creations: It's Your Birthday! Hello! Today's card is a combination of 2 challenges! This sketch and the color challenge were so much fun to work with. This card definitely made me think of summer time! I used lots of different dies. The doiley is actually the Spellbinders Eyelet Pendants Die. I not only cut it out, but embossed it, too. I hope you can see this detail. You may have to enlarge the picture by double clicking on it. I did not have to emboss the yellow card. It is paper by Bazzil that is already embossed! The flowers were made using the My Favorite Things Rolled Flower dies. I just love these dies! Hope you like the card. Thanks for stopping by! Oh Mackie, this is so FAB! THX for telling that you embolled the doily or I might have missed that FAB detail! LOVE the papers and you KNOW I just LOVE your rolled flowers! THX for playing with us at CR84FN! This is beautiful Mackie...the colors are arranged perfectly! 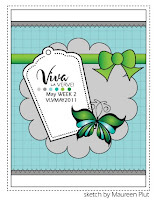 Love that delightful yellow bow and the gorgeous Verve tag/sentiment! Great work! Hi Mackie!!! This card is GORGEOUS!! Love the tag and the rolled flowers!!! WOW! Great job girl! Thanks so much for playing along with CR84FN! Congrats on the top 3 pick! It's wonderful! I'm in the Top Three this week at CR84FN! Heard you caught a bug! 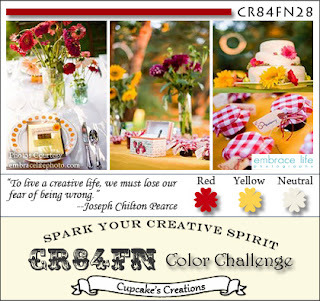 Time for another CR84FN Color Challenge! Ice Cream Makes Everything Better!